My first acrylic painted nails! I have always done my nail designs with nail polish. Out at a craft store yesterday I saw some Reeves acrylic paint sets for $20 and I couldn't pass up the deal. 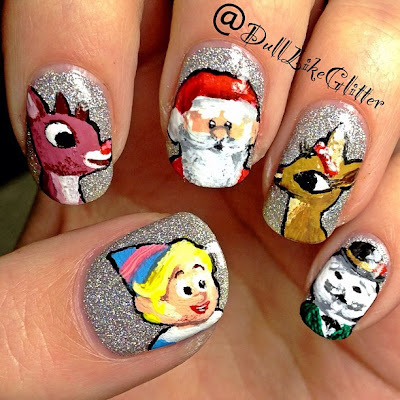 I wanted to do some holiday nails so I went from some Rudolph nails! They came out amazing! Acrylic is so easy to blend and work with. You can always water it down to make it more liquid and workable. I used China Glaze Glistening Snow for the background and Glisten & Glows HK Girl top coat to seal the paint in. Instagram Shopkick Nail Art Contest!